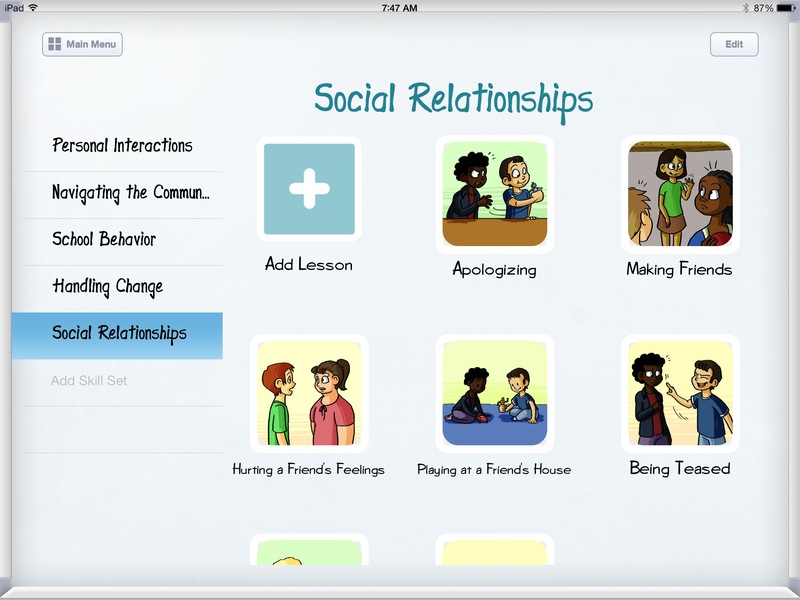 We are so excited about the release of Let’s be Social! It’s been out for two weeks and we’ve gotten a lot of great feedback. 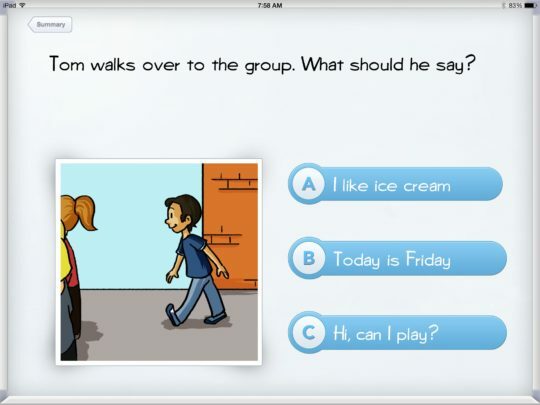 Now that people are using Let’s be Social!, I want to demonstrate how I use the app to work on pragmatic language (social) skills with my students. Some of my kiddos who have autism or developmental delays have trouble picking up on social cues when interacting with peers. I use Let’s be Social! as a tool to teach students how to respond in a given social situation by summarizing an interaction and using questions in the lesson as a way to teach expected actions. To start, we have to pick a lesson. In some cases, it can be nice to give the students a choice. Some of my students are aware of what is difficult for them. I like to have discussions about that and then let the student decide what lesson would help them. If you have an example of a time when the student had a hard time with a skill, this is the perfect time to talk about it. For example, I’ve seen a few of my students walk over to a group and just stand there, not knowing how to join in. In that case, I would use the lesson “Joining a Group” with them. 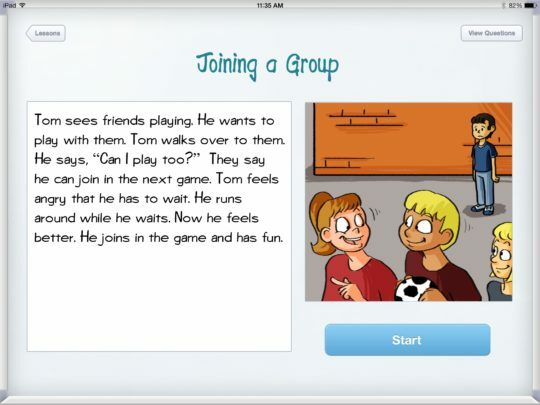 Once you select the “Joining a Group” lesson, you are brought to a summary which introduces the lesson. I would have my student read it out loud if they can, and then I would read it again. This is a nice place to support the student’s comprehension by asking them who is in the story, what their problem is, and how do they feel. You don’t have the break down every part of the summary because the questions do that, but it is important to make sure they understand what the story is about. Now you go through the questions and answers. I take a lot of time here to talk about the illustration and break down each part of it. I ask, “Who do you see, what is happening, and how do they look?” You might have to repeat the question multiple times and highlight aspects of the picture (Look at his face and body language… or look at what he is doing here). Help the students out by showing them what to look for. This way, they can start to use these skills in their own life. Once they select an answer, don’t just move on. Take the time to talk about why the answer is correct or incorrect. When a student picks the wrong answer, the app lets you go back and try again. After you’ve gone through all of the questions you’ll end up back at to the summary page. This is where I review what we learned. I don’t always read the whole story again. Instead I check the student’s understanding by asking what the problem was, how did it make others feel, and how did they fix the problem. Sometimes I need to scroll back to the questions so the student can see part of the story again. The visuals really help the students out because these discussions are language heavy. I also try to tie the story to my student’s life. Ask them if this ever happens to them, or talk about the story and insert your student in. Ask what they would do in this situation. I always include questions about other peoples’ feelings and how my student can know how someone is feeling. My students need a lot of practice reading other’s emotions and the social cues around them. Another great way to deepen your student’s understanding is to act the lesson out. I like to get a couple students involved and role play the situations. This way, they can see the story play out. Seeing it in their own classroom with their peers and friends helps my students understand the lesson in a more concrete way. Once the lesson is finished, I always praise my students and tell them what they did well. The app helps out by giving visual positive reinforcement at the end of every lesson. Gold stars pop up which are shaded in for every correct answer they got (I usually record the number they got correct). It also helps the student see that – wow they got them all right, or “nice job and we can get more right next time”. I feel so great when I can see my students feel proud after a lesson. If you have questions on how to implement our lessons with your students, let us know. If you have suggestions for lesson topics, tweet us or send us a message on Facebook!